When you look at the current state of the music industry, with the likes of Justin Bieber and Taylor Swift all occupying the sound booths and distributing the sort of pop that makes both executives and financiers happy, you can’t help but feel the need for someone like Brian Wilson to take over and shake things up a bit. Wilson, the subject of Bill Pohlad’s biopic Love & Mercy, has led a topsy-turvy life as the film depicts, but the former Beach Boy’s originality and unique musical style has undoubtedly left an impact on music as a whole which, in a time when music has become so safe and so eager to not stand out aside from a few catchy tunes, desperately needs to be brought back in some shape or form. However, as Bieber et al continue to dominate the airwaves, it seems that, for now, this film is the closest we’ll get to recapturing his enthusiasm and unique voice – and it’s a perfectly satisfying, if a touch flawed, tribute. The film takes place over two periods of Wilson’s life, with us first seeing 60s Wilson (Paul Dano) attempting to create what would ultimately be the revelatory album Pet Sounds, using a mixture of real musicians and other unconventional additions such as barking dogs and studio directions. All the while, the mixture of his erratic behaviour and mental psychosis starts to overwhelm both his fellow bandmates and himself, leading to a breakdown brought upon by psychedelic drugs and uncertain realisations of his own musical genius. The second period takes us to 1986, where Wilson (now played by John Cusack) is a broken shell of a man with a diet of pills prescribed by his increasingly exploitative therapist Eugene Landy (Paul Giamatti), and how his relationship with Cadillac saleswoman Melinda Ledbetter (Elizabeth Banks) is affected by Landy’s controlling behaviour. Both sections may sound like two very different films, but they both manage to complement each other quite nicely and never manage to divert attention or tone from one to the other. This is a problem that films like Saving Mr. Banks and Focus had, combining two separate sections that were vastly different from each other and not have them blend together as well as the filmmakers would have liked. Pohlad, with a script by Oren Moverman and Michael Alan Lerner, is able to sew both time periods together as seamlessly as possible, creating two very different portrayals of Wilson that help to create a very complex melody of the musical savant. Dano’s Wilson is more in his prime, youthful but also with a great passion for his musical talents that only threatens to be undone by his own deteriorating mental state; Cusack’s Wilson, meanwhile, really feels like he’s gone through hell, a quieter and more timid collection of someone convinced of their own worthlessness thanks to the tyrannical control of Landy, the spell of which starts to be broken by the warm nature of Melinda who he truly cares for. Needless to say, both Dano and Cusack shine as their own respective renditions of Wilson, with Dano getting the edge with just having more meaty material to work off of. Banks and Giamatti, as heroic and villainous archetypes respectively, never let their roles slip into full caricature, Giamatti especially, and create the roles as something truly their own. The performances may be stellar and the direction and script is top notch, but the real star of the entire thing is Wilson himself. The film pays a loving tribute to his undying love for music and his own unique talents, and as we see Pet Sounds being developed and recorded we can see through Dano’s portrayal the sheer excitement he has for the fact that something that is truly his own is being realised for the first time. He is simply having a ball just putting together the album which would eventually be regarded as one of the greatest of all time, even though many collaborators such as his bandmates and even his own abusive father express their high levels of concern and doubt. But he doesn’t care: he just wants to create what he wants to create and not what everyone else expects him to do, which to some is the sign of a true artist; never giving in to convention and just making a reality what truly drives a person. The film portrays both the highs and lows of his life – or at least, the two sections that the film shows anyway – to a very moving and quite profound way, and it’s likely that the real Wilson and the other surviving people that this film portrays will be highly satisfied with how well it complements his musical genius and those that truly supported his vision. The film even ends with a recording of Wilson in concert, showing that even to this day he is still in the groove without showing signs that he’s past his prime in any way shape or form. Overall, Love & Mercy is a fascinating film that takes risks and pushes aside convention, much like its subject, to portray the complicated mind of Brian Wilson as best as they possibly can. Though it’s likely that we will not see such a unique talent in the recording studio for a good long while, and as long as Bieber and many more executive-approved talents continue to make money we’ve a long wait ahead of us, this film should serve as a healthy reminder that music can be considered art in the same way that the Mona Lisa is considered art, but we need artists with a once-in-a-lifetime vision to make it so. Brian Wilson was, and still is, one of those artists, and by God do we need more of that today. 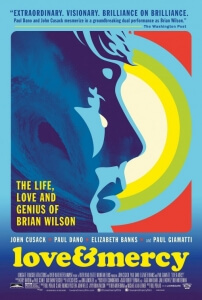 Love & Mercy composes a loving melody for Brian Wilson with this unconventional but fascinating biopic of the former Beach Boy’s life, with Paul Dano and John Cusack delivering two separate but equally compelling renditions of the man while never overshadowing his real-life passion for music and his unique vision that makes him one of a kind.